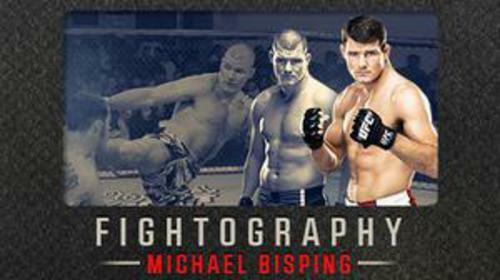 Fightography: Michael Bisping Oct 9, 2014 (13:29) Michael Bisping is one of the most recognizable characters in MMA, a divisive force who has entertained and enraged in equal measure during an already eight year run in the UFC. But there was a time before the brash interviews and big fights when “The Count” was merely a wannabe from the north of England struggling to provide for his young family. 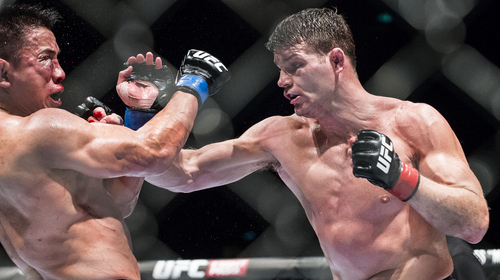 In this Fightography, a candid Bisping opens up about the enormous sacrifices he made to even become a MMA fighter. 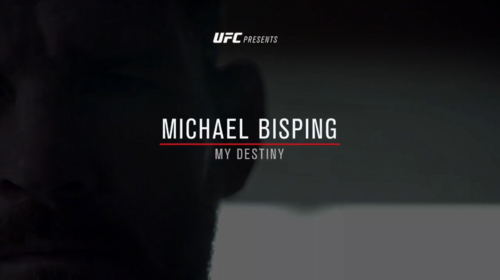 Michael Bisping: My Destiny Sep 25, 2016 (48:06) From his early days growing up in Manchester, to his first professional fight, to his ten year battle to become UFC world champion, we speak to all the key figures in his life who who have influenced him over the years - his family and friends, coaches trainers and fighters all of whom have contributed to the moulding of the career of the UK's first UFC Champion. Michael Bisping vs. Kristian Rothaermel TUF Season 3 Quarterfinal Apr 27, 2006 (7:02) In the opening round of TUF 3’s light heavyweight elimination tournament, Michael Bisping makes his intentions in the competition very clear by putting a beatdown Kristian Rothaermel. 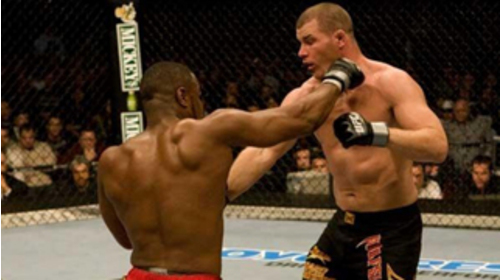 Michael Bisping vs. Ross Pointon TUF Season 3 Semi-final Jun 15, 2006 (5:58) When Matt Hamill was forced out of the light heavyweight tournament, Michael Bisping was left without an opponent in the semi-final of the third season of The Ultimate Fighter. Two other contestants refused to face “The Count” but middleweight Ross Pointon leapt at the chance to get revenge over Bisping. 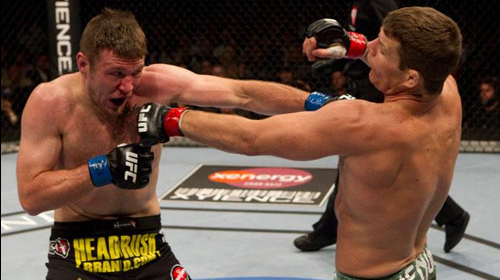 The British pair has previous fought outside of the UFC, with Bisping taking a round submission. Michael Bisping vs Eric Schafer UFC 66 Dec 30, 2006 (13:35) England's Michael "The Count" Bisping entered the bout with Eric Schafer not only as a rising light heavyweight prospect and winner of the 3rd season of TUF, but also as the hope of the UK to see their countryman succeed against the deadly game of Schafer. 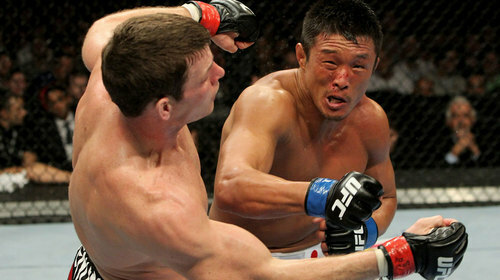 Michael Bisping vs Elvis Sinosic UFC 70 Apr 21, 2007 (14:27) 'The Count' took on 'The King of Rock n Rumble' at UFC® 70. Bisping put Sinosic on his back in a dominate first-round performance but in the second round, Sinosic had a few tricks up his sleeve in an attempt to try and spoil the Brit's homecoming. Michael Bisping vs Matt Hamill UFC 75 Sep 8, 2007 (33:18) The tension between these two fighters rose when they were training partners and teammates on the 3rd season of TUF, and at UFC 75, Michael Bisping and Matt Hamill finally got a chance to meet in the Octagon. Michael Bisping vs. Charles McCarthy UFC 83 Apr 19, 2008 (14:22) After winning the 3rd season of The Ultimate Fighter, Michael Bisping had become the UK’s ambassador to the sport. He recently had suffered his 1st career loss, but he was hoping the move to the middleweight could enhance his already proven skills. Michael Bisping vs. Jason Day UFC 85 Jun 7, 2008 (17:25) Michael Bisping and Jason Day both returned to the Octagon after impressive wins at UFC 83. 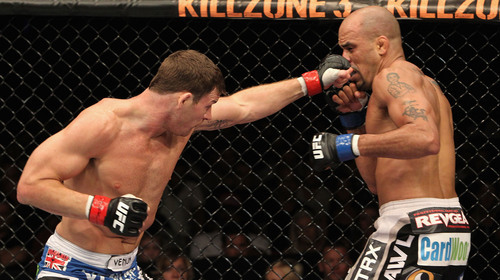 Day played the role of underdog for the second fight in a row, while Bisping was energized fighting in front of his fellow Englishmen. 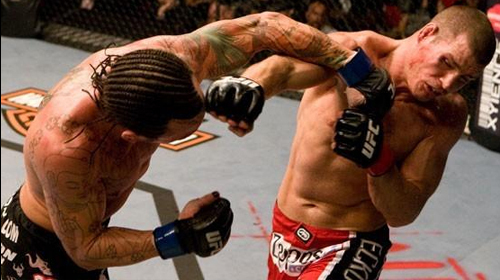 Michael Bisping vs. Chris Leben UFC 89 Oct 18, 2008 (34:19) The UFC took over England for UFC 89. In the main event, Michael 'The Count' Bisping had the backing of his home country as he faced a renewed Chris 'The Crippler' Leben. Michael Bisping vs. Denis Kang UFC 105 Nov 14, 2009 (22:52) Michael Bisping made a huge tactical mistake when he circled into the path of Dan Henderson’s unforgiving overhand right. He had a chance to redeem himself when he faced Denis Kang in an arena full of his British countrymen. Wanderlei Silva vs. Michael Bisping UFC 110 Feb 10, 2010 (31:51) Armed with an extremely aggressive fighting style, Wanderlei Silva took on perennial contender Michael Bisping, who was always looking to push the pace. Michael Bisping vs. Dan Miller UFC 114 May 29, 2010 (29:14) The pride of Britain traveled to Las Vegas to take on Dan Miller in this middleweight matchup. 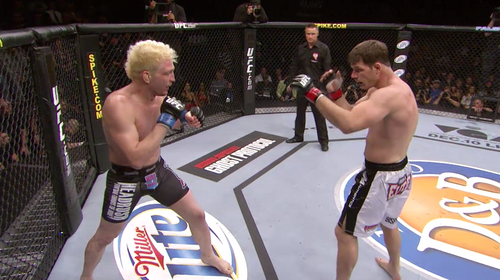 Michael Bisping rose to fame after winning the 3rd season of TUF. 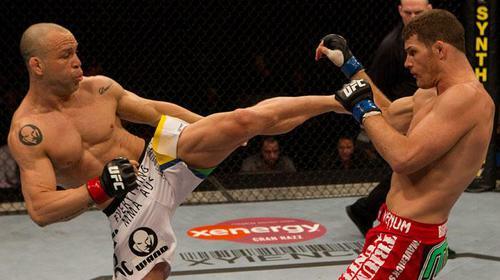 Miller was a blue-collar fight veteran with a rugged grappling game. Michael Bisping vs Yoshihiro Akiyama UFC 120 Oct 16, 2010 (35:10) In the headlining bout of the UFC 120, British MMA prince Michael Bisping looked to electrify the English crowd in his fight versus Yoshihiro Akiyama. Michael Bisping vs. Jorge Rivera UFC 127 Feb 27, 2011 (24:26) Manchester, England's Michael Bisping had done well since dropping down to middleweight with a recent victory over Yoshihiro Akiyama, which was dubbed Fight of the Night. But, after all the trash talking, Jorge Rivera was ready to show Bisping why he was known as "El Conquistador." Michael Bisping vs. Jason Miller TUF 14 Finale Dec 3, 2011 (30:45) After a full season of trading verbal barbs & dirty looks, the coaches would finally clash in the cage as TUF 3 winner Michael “The Count” Bisping, making his 15th Octagon bout, rumbled with the highly-experienced submission ace Jason “Mayhem” Miller. 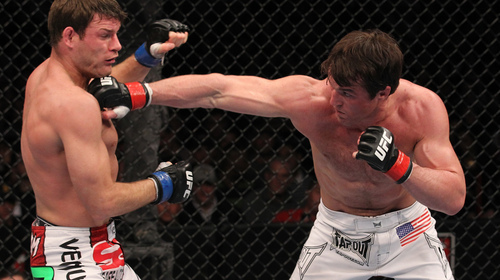 Chael Sonnen vs. Michael Bisping UFC Fight Night Jan 28, 2012 (21:33) UK hero Michael 'The Count' Bisping and Oregon's Chael Sonnen were some of the grittiest fighters in and out of the Octagon. Whether it was a war of words or 5 rounds of battle, they both brought the heat. 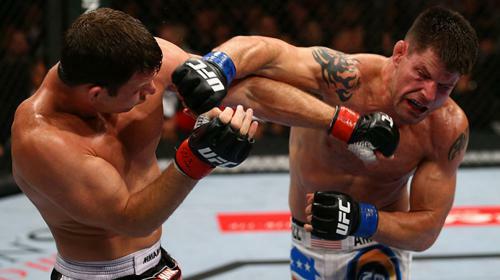 Michael Bisping vs Brian Stann UFC 152 Sep 22, 2012 (29:19) Middleweights Michael 'The Count' Bisping and Brian 'All American' Stann collided in a UK vs US battle. Vitor Belfort vs Michael Bisping UFC Fight Night Jan 19, 2013 (23:53) After an exciting shot at the UFC light-heavyweight title, “The Phenom” Vitor Belfort went down to middleweight and was ready to climb the ranks against perennial top 10-er Michael “The Count” Bisping, who, with a win, would get a title shot of his own. Michael Bisping vs. Alan Belcher UFC 159 Apr 27, 2013 (33:14) After a back-and-fourth war of words, Michael 'The Count' Bisping and Alan 'The Talent' Belcher finally settled their differences inside the Octagon at UFC 159. 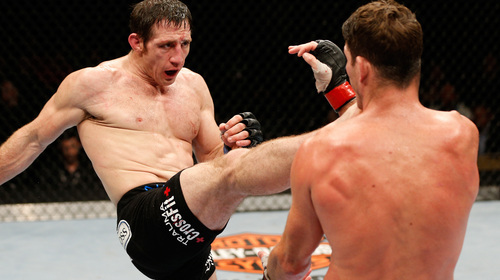 Tim Kennedy vs. Michael Bisping UFC Fight Night Apr 16, 2014 (39:10) They had been testing each other verbally for months, but in Quebec City, middleweight contenders Michael Bisping and Tim Kennedy would settle their score for real in the Octagon. Michael Bisping vs. Cung Le UFC Fight Night Aug 23, 2014 (32:07) As we count down to the hotly anticipated collision between bitter rivals Luke Rockhold and Michael Bisping in the main event of UFC FIGHT NIGHT SYDNEY, which is exclusively live on UFCFIGHTPASS.com on November 8 (November 7 in North America), FIGHT PASS is proud to present a chance to view Bisping’s impressive win over Cung Le, which took place on August 23 in Macau. Britain's Ultimate Fighter Oct 8, 2014 (46:10) This 2006 documentary spotlights a young Michael Bisping, fresh from winning the third season of The Ultimate Fighter, as he counts down to his Pay-Per-View debut at UFC 66 against Eric Schafer. This film has not previously been made available outside of the UK.